Once you have gathered your supplies, take the Q-Tip and run it across the inside of your cheek to moisten it. Smear the swab on your blank slide, and put a cover slip on top of it. Place the slide under the microscope and focus at the lowest magnification first (40x), then move up to 100x and finally 400x. What do you see? There are several items you may be able to view including bacteria and your cheek cells. 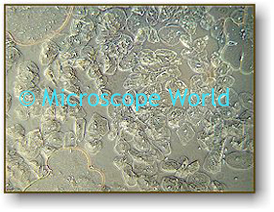 This is an image that was captured at 400x magnification of cheek cells. Can you identify the nucleus of each cell? It is the small dot in the center of each oval shaped cell. This is an image of bacteria. Usually bacteria cells are rod-shaped. You can identify some of the different types of bacteria shapes here. There is always bacteria in your mouth - and not all bacteria is bad. Even the yogurt you eat for a snack has bacteria in it!